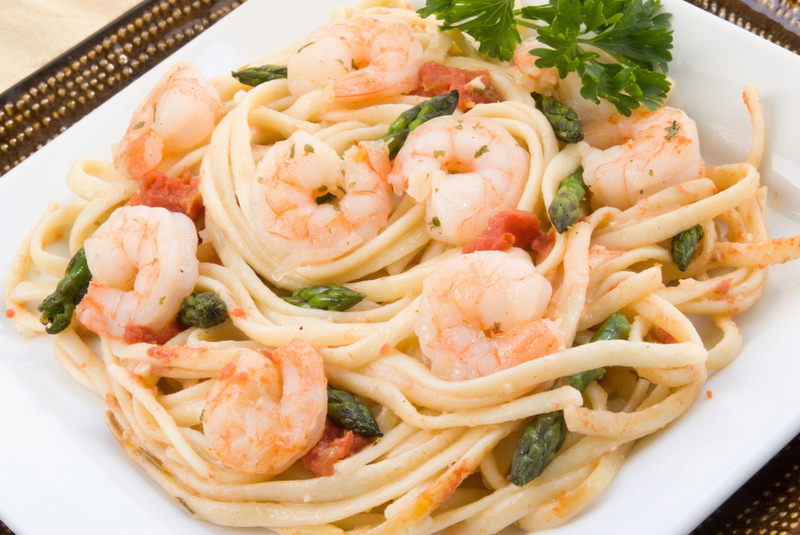 This is a simple and healthy shrimp and asparagus recipe using linguine. For optimal health benefits, use whole grain pasta. I find that sauces using tomato and garlic like this one do a pretty good job of flavoring whole grain pastas. It isn’t specifically in the recipe since it adds calories, but sprinkling feta cheese of the top of this before serving is delicious! Feta tastes wonderful with shrimp and pasta and while, yes, it adds some calories, it still is one of the healthier choices when it comes to cheese. Bring a large pot of water to a boil in a large pot over high heat. Add the pasta and ½ teaspoon salt, stir a few times to submerge and separate the strands. Cook until just tender to the bite (al dente), about 8 minutes (or according to package directions). Reserve about 1 cup of the pasta cooking water. Drain the pasta well in a colander. While the pasta is boiling, prepare the shrimp: Heat the oil in a deep sauté pan over medium heat. Add the garlic and cook, stirring occasionally, until aromatic, about 30 seconds. Add the red pepper flakes and shrimp. Saute until the shrimp is bright pink and opaque, 3 to 4 minutes. Add the tomatoes and asparagus spears. Saute, stirring frequently, until the asparagus is bright green and hot, about 2 minutes. Add the reserved pasta water and bring to a simmer. Add the drained pasta to the shrimp and toss together over medium heat until the very hot, about 2 minutes. Remove the pan from the heat and stir in the parsley. Serve at once in a heated pasta bowl or individual pasta plates. That looks amazing!! I love shrimp on pasta, and asparagus makes everything wonderful. We usually make this with zucchini noodles, not for any specific vegan reason, but because it tastes so damn good!